Inside my head and heart reside Writing Drill Sergeant and Writing Saboteur. They don’t get along. Especially after a manuscript rejection. “Supposing it didn’t,” said Pooh after careful thought. Piglet was comforted by this. The bad feelings are about to start all over again. Then she (a regular girl) notices something surprising. There are some parts of the WRONG things that are really quite RIGHT. . . . By the time she reaches the end of the trail, she finally knows how to make the thing MAGNIFICENT. She gets to work. How many times have you written a story or thought of an idea, only to read or see something similar, somewhere else, a day, a month, or a year later? I wonder what Dan Santat, creator of The Adventures of Beekle, The Unimaginary Friend and the creators of Big Hero Six thought when they first saw each other’s chubby white guy protagonists. Did they notice the physical similarities? If so, did they say, “Oh, look! Great minds think alike! I’m so flattered!”? Or, did they say words you shouldn’t express in picture books or PG movies? I had just finished a manuscript about a dog who glories in the food of his master, loses all hope when his master changes his eating habits, and regains hope again when a meatball plops on his tail. 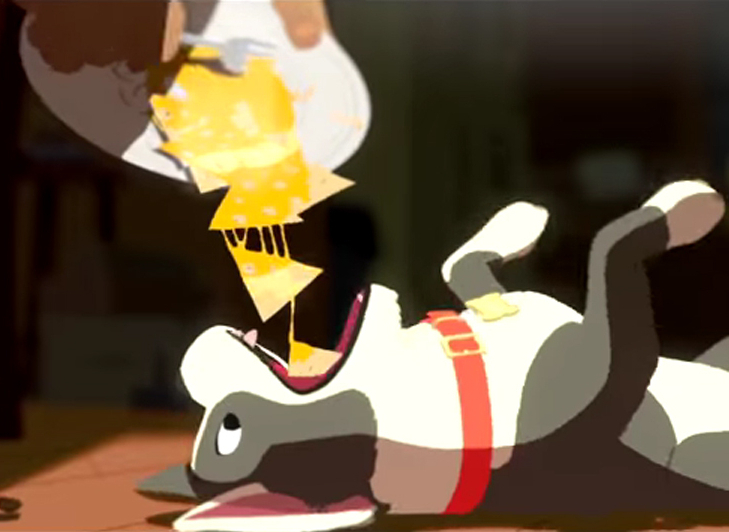 Then I saw the short film The Feast. My heart plopped like that meatball. I wrote an alphabet manuscript revealing the ABCs through children’s name. 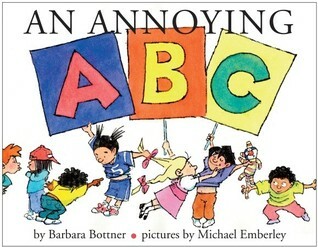 Then I read Annoying ABC by Barbara Bottner, an alphabet book revealing the ABCs through children’s names. I wrote about an ostrich who wants to fly. 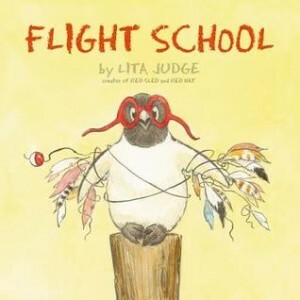 Then I read Flight School by Lita Judge, about a penguin who has an ostrich friend who wants to fly. I changed the character to a pig. Then I saw a television commercial with a flying pig and remembered Mo Willems’ Today I Will Fly. So I changed the protagonist to a giraffe. Then I saw Birds Can Fly and So Can I, by Noa Nimrodi. How about a Mouse? 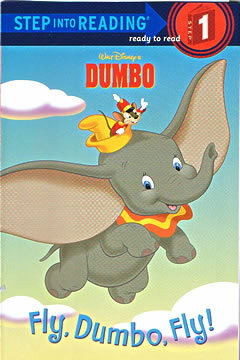 Or better yet, an elephant, you say? Books serve to show a man that those original thoughts of his aren’t very new after all. Idea clones don’t haunt the pros. The most successful artists don’t sweat over being original, they sweat over being authentic. 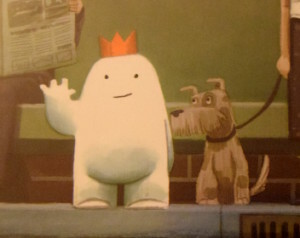 Look at Beekle. 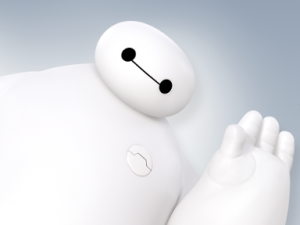 Dan Santat knows his creation is a totally different guy than Big Hero Six. He’s laughing all the way to DreamWorks Animation, with his Caldecott Medal. 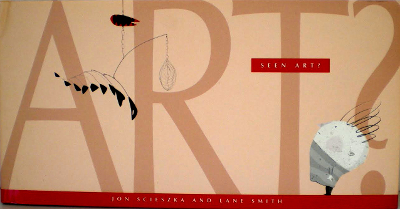 Look at Art. 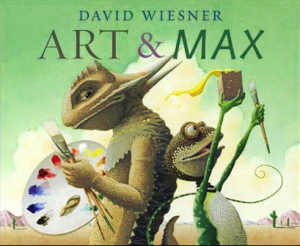 He’s the central character who makes for funny wordplay in Jon Scieszka and Lane Smith’s Seen Art?, David Wiseman’s Art and Max, and Kelly Light’s Louise Loves Art. Everyone loves Art. No one cares that his name isn’t original. Really, there’s not an original idea out there. If you can imagine it, someone else can and likely has. It’s like naming your child “Ava,” thinking you’ve thought of the most original name in the world. Luckily, no one else is going to create an Ava or an Art just like your Ava or Art. So, in our own small way, we can be original in our authenticity. Here’s to chubby white guys, Avas and Arts. We look forward to seeing more of you in the future. Have I mentioned how honored I am to be mentored by Trisha Speed Shaskan? Seriously, I have to pinch myself. 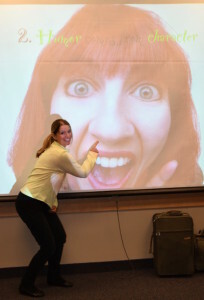 She’s witty and entertaining, with funny snort-laughs that make your heart happy. She’s accessible and sincere. In her you’ll meet an advocate and friend. And she’s humble, not intimidating, generously giving of her time to nurture the success of others. 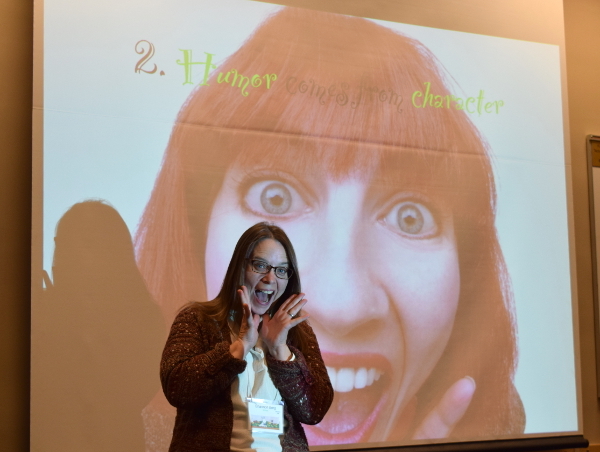 She’s all of this, despite her rock star accomplishments as a children’s author of over 40 books. What I’ve learned from her through observation in the past two months is how a true professional views and handles success. Through Trisha I’m reminded how much our creativity is a gift to ourselves and others.Trisha is just as excited about the ideas in her head as the stories already published. 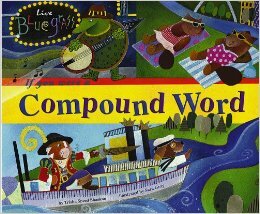 She knows that each word is the beginning of something bigger and that success doesn’t begin or end at publication. As long as you are able to create, whether you’ve written one paragraph or 40 books, no magic number should make you want to retire to a beach (unless you’re bringing your laptop or notepad). A couple of weeks ago teacher Regina Santiago and the students in 1/2 B at Saint Paul Academy surprised Trisha with the ultimate compliment. 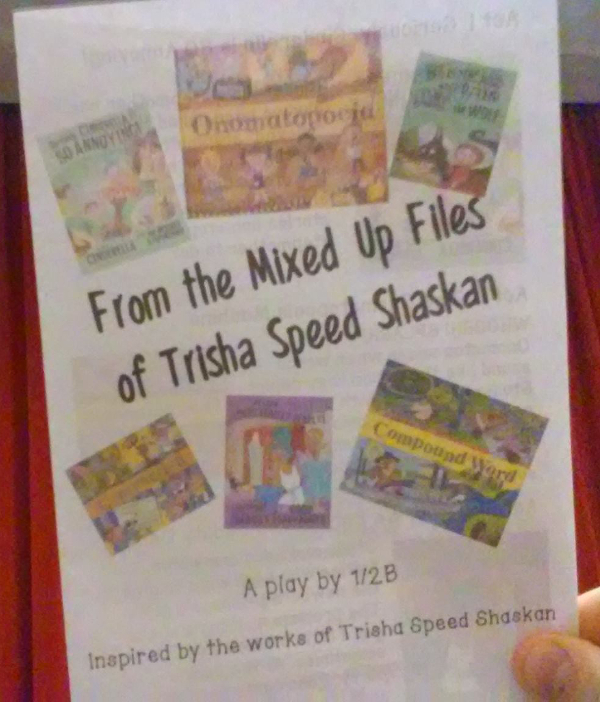 They created a play, From the Mixed Up Files of Trisha Speed Shaskan, based on six of her picture books. Trisha and her husband Stephen received VIP treatment during the performance, complete with programs. The actors proved they’d done their research. 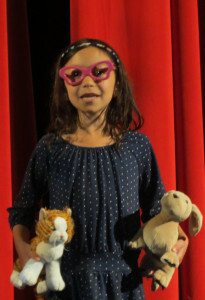 The mimi-Trisha narrator donned Trisha-style glasses, clothing, and hairstyle. She also incorporated Trisha’s mannerisms and words like “ridic” and “peeps.” Shaskan’s cat, Eartha, and dog, Bea, even received “mini-me” representation. 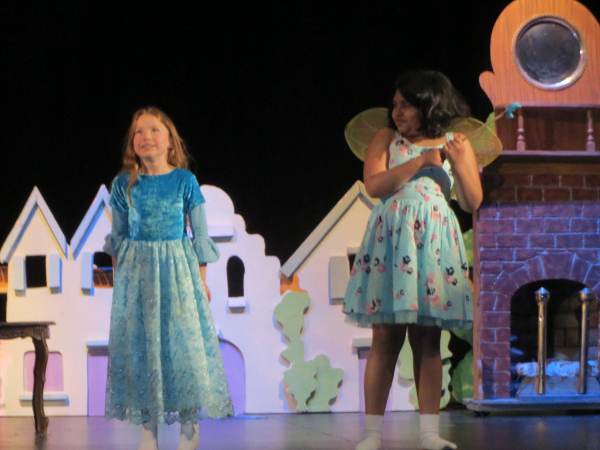 The good and bad fairies. 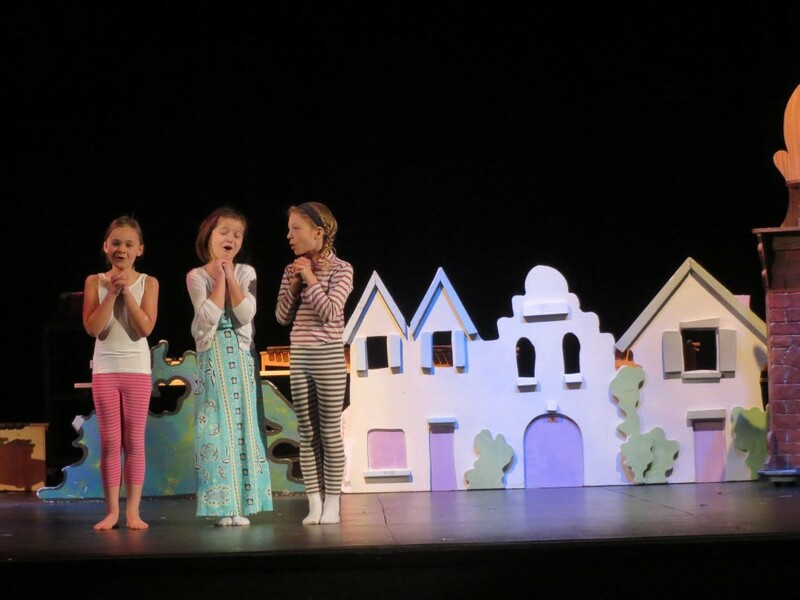 The young thespians created and performed stories . . . 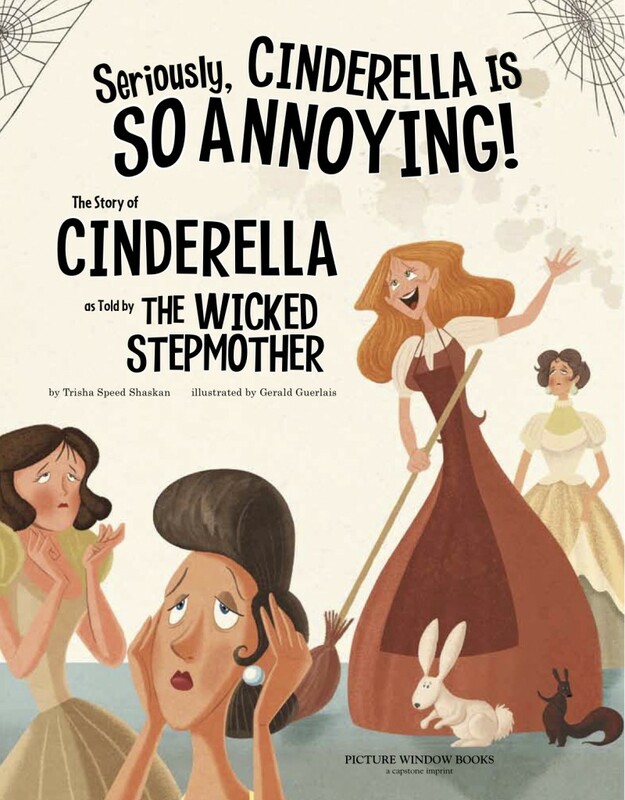 The wicked stepmother and evil stepsisters. sang songs . . . (masterminded by Stephanie Huss). and shared the sounds of their onomatopoeia machine invention. 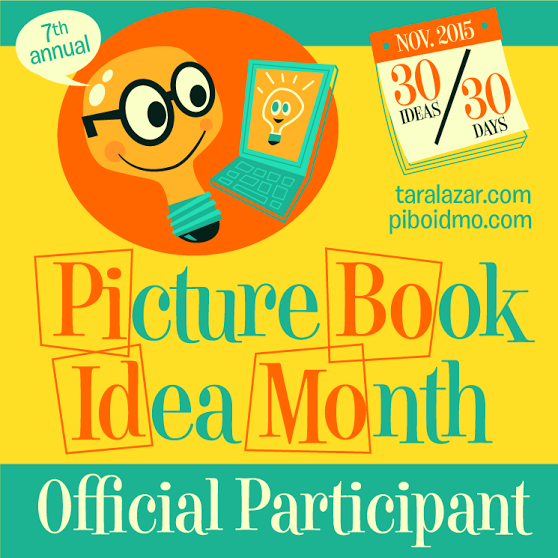 Through Trisha I’m learning that creativity shared can reach far beyond the confines of a book or story. 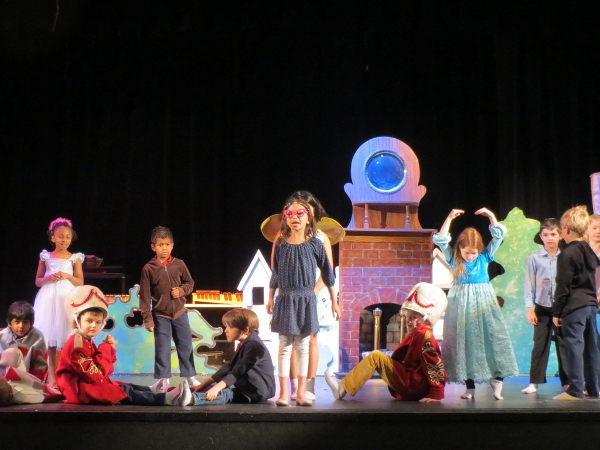 The ripple effect of imagination can reach beyond our wildest dreams. With delight and gratitude in the unexpected. Remembering every celebration is just the beginning. 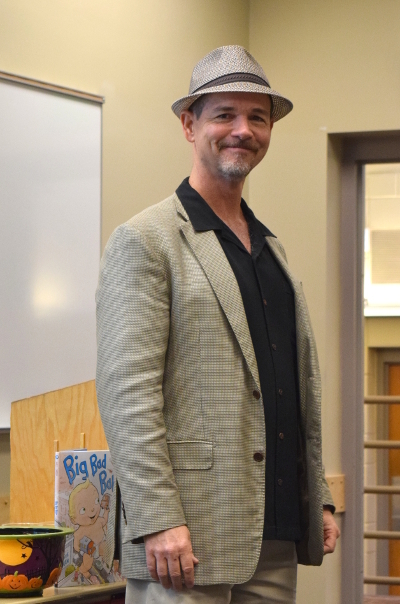 Kate DiCamillo wanted a picture with me, so of course I said . . . Okay, you know that’s not true. I’ll admit, I stalked her. 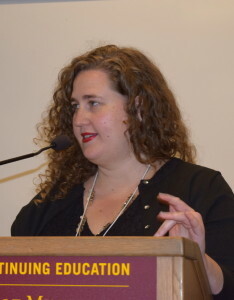 That certainly was the case while sitting among 900 other writers, illustrators, agents, editors, librarians, publishers, and book enthusiasts at the 27th Annual Minnesota Book Awards Gala. 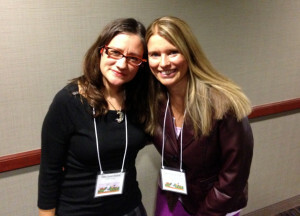 Holy cow, it was literary celebrity Heaven. My only regret: that I didn’t take more pictures. 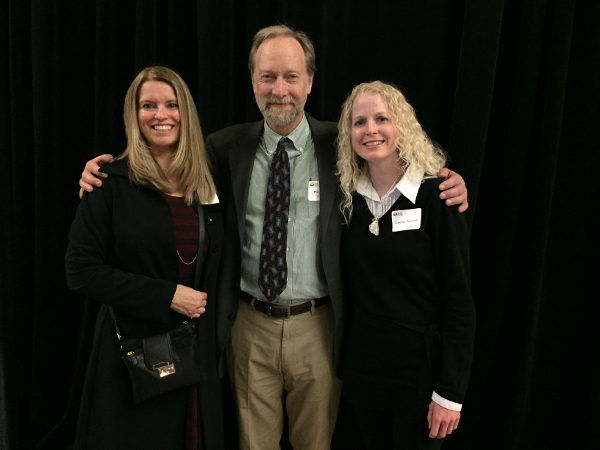 Congratulations to all Minnesota Book Award finalists and winners! You could find children’s book author Trisha Speed Shaskan in a crowd. She’s the “cool glasses” girl. She also has great taste in meeting places and mentors. 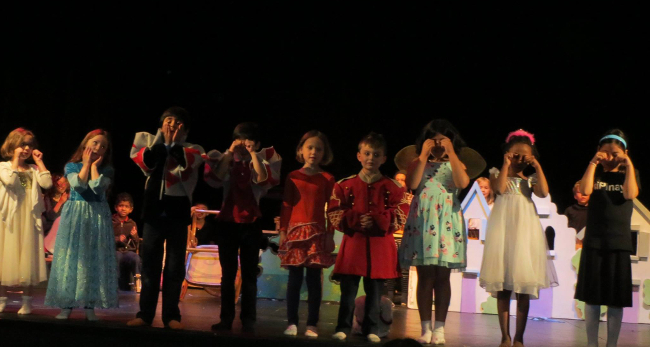 It takes a village to raise a writer. Find a good village. I’m one of those people who needs leaders to hold the bar for me and make me believe that it’s within reach. We all learn better with a diverse group of people challenging, inspiring, and encouraging. That’s why I was relieved to know that my mentor, too, has mentors. My mentor’s mentor: Jane Resh Thomas. When an SCBWI friend mentioned that Jane Resh Thomas workshops were available, I had no intention of attending, thinking I was much too busy. I really had no clue what a big deal these workshops were. 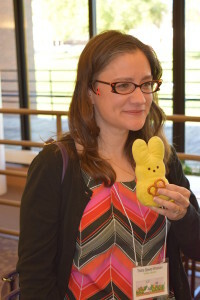 Jane Resh Thomas, a recipient of the Kerlan Award for contributions to children’s literature, is the author of fifteen published and contracted books, including picture books, short fiction, middle-grade fiction, and biography. 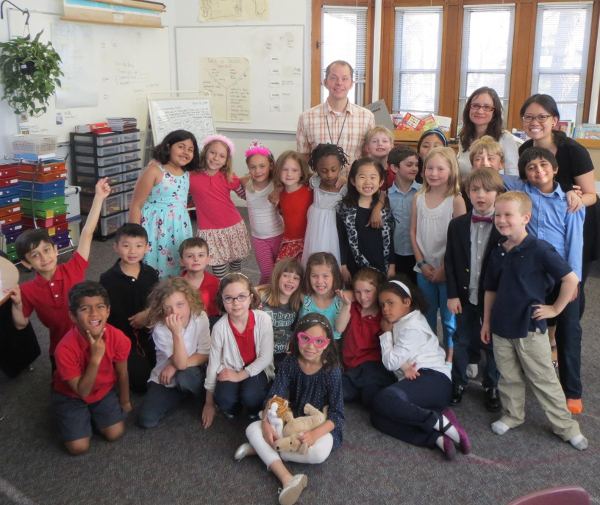 The Comeback Dog; Saying Good-Bye to Grandma; Courage at Indian Deep; and Behind the Mask: The Life of Queen Elizabeth I have won, among other honors, a Parent’s Choice Award; Notable Books and Best of the Best listing by the ALA; and a Minnesota Book Award. Her most recent books from Clarion are Blind Mountain, an adventure story, and The Counterfeit Princess, a historical novel. I couldn’t email Ms. Thomas fast enough. She only had one opening available. I took it. 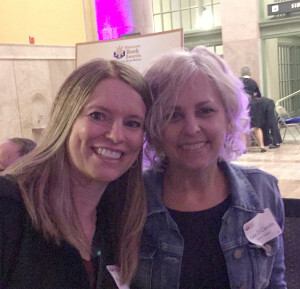 Before my first class, another friend emailed me a link to an article recognizing Minnesota children’s literature superstar Kate DiCamillo as STAR TRIBUNE’S Artist of the Year. 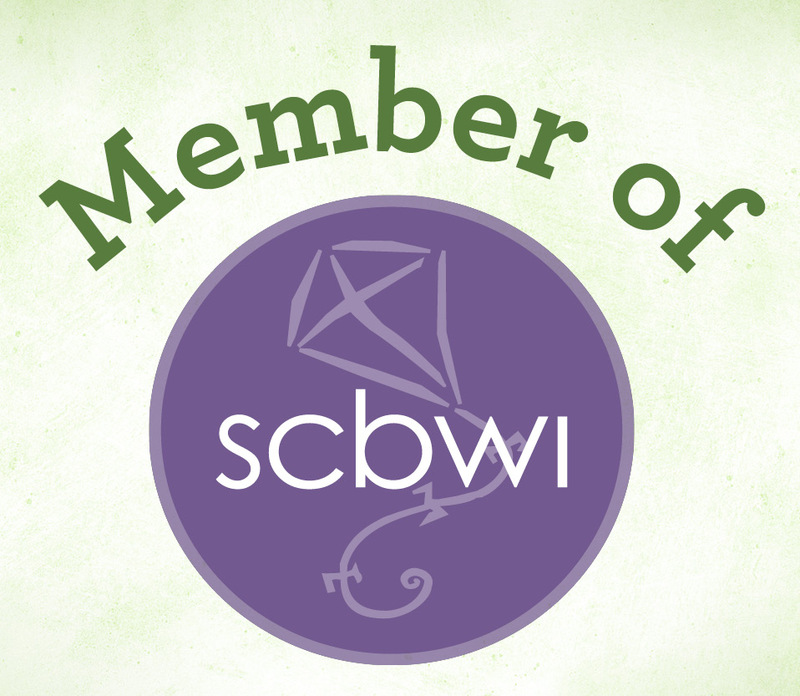 Kate belonged to a writer’s group led by–wait for it–Jane Resh Thomas. That only sweetened the deal. I’ll have tangible tips from Trisha in the February mentorship post. In the meantime, I hope you’ve found your cheerleading leaders. 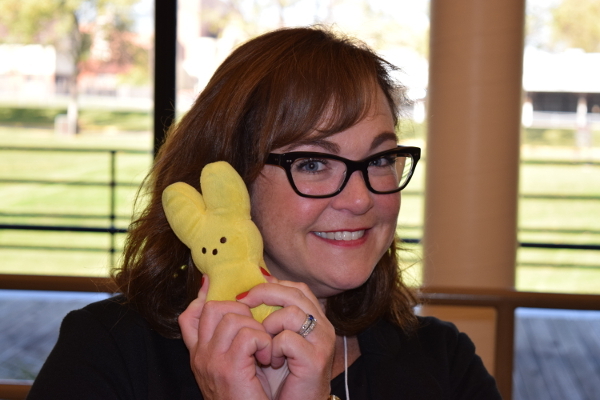 The reason Trisha is such a fabulous mentor (besides all the talent, personality, and humility, of course) is that she comes from a fabulous village and she’s a fabulous mentee. Recently, my wise writer/illustrator friend, Elise, marveled that we’re learning so much while reading, researching, writing, and reviewing with our writers groups; it’s like receiving a free graduate degree in children’s literature. 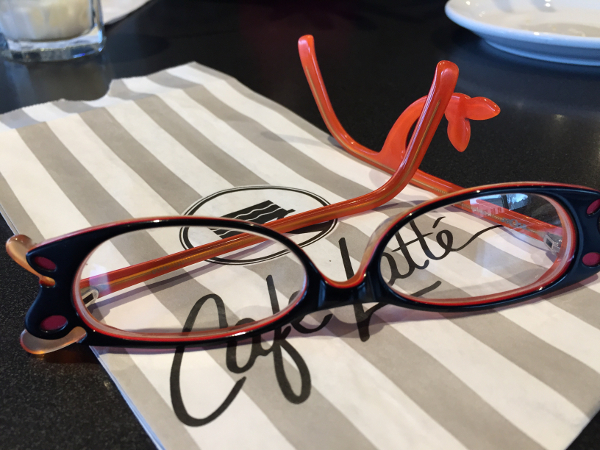 Her reflection sparked this meet-up mindset for me: This is more than friend-time. 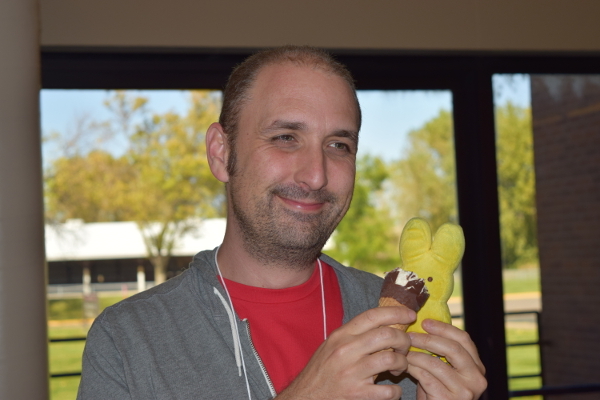 I’m part of a graduate program, learning from some of the best and the brightest. Don’t take one minute of this for granted. 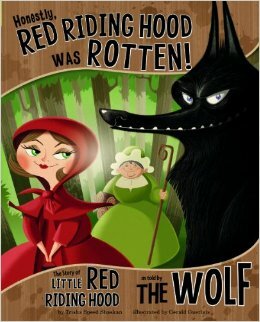 2014-2015 SCBWI Writer Mentor Trisha Speed Shaskan has written over 40 books, including HONESTLY, LITTLE RED RIDING HOOD WAS ROTTEN! 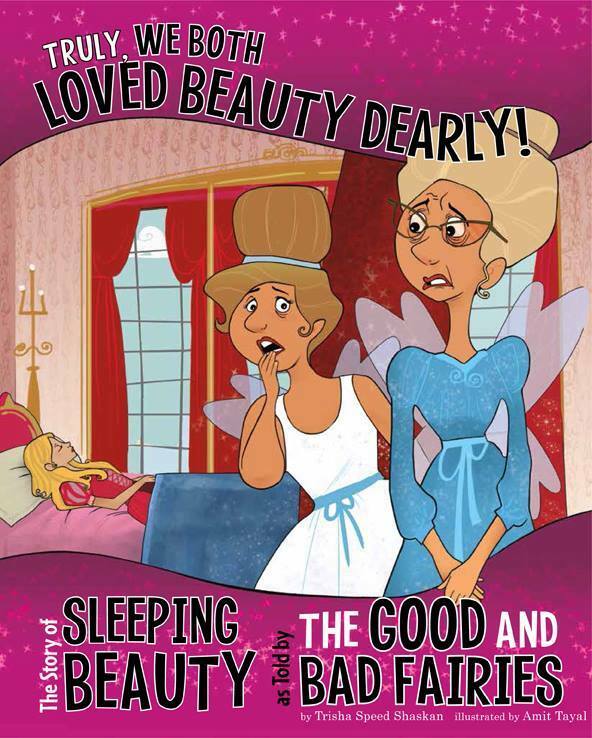 ; TRULY, WE BOTH LOVED BEAUTY DEARLY! ; and her 2015 release, PUNK SKUNKS, co-created with her husband, Stephen Shaskan. I’m beyond grateful for this opportunity to learn from her and get to know her as a friend and fellow lover of children’s literature. After friendship, the best part about writers groups is the knowledge we share. For me, it’s definitely a win-win, because my comrades are all smarter than me. We’re like one big, spongy, interconnected brain. 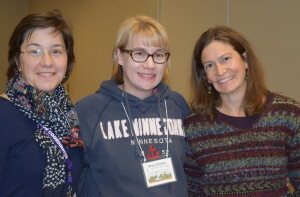 So, of course I had my writing friends in mind when I was selected this October by the MN Society of Children’s Book Writers & Illustrators (SCBWI) Conference Committee for the 2014-2015 Writer Mentorship with children’s book author, Trisha Speed Shaskan. Woo hoo! I would finally have something juicy and substantial to bring to the table! I’m honored that Ms. Speed Shaskan (Trisha) and the committee found promise in my work and are devoted to prodding me past mediocrity. To pay this kindness forward, I’ve asked Trisha if I could share her wisdom, not only with my writers group friends, but with anyone who visits this blog. She generously said “yes,” so, rather than recapping from memory, I’ll share the email I sent to my critique friends. I met with Trisha last evening and came away with a treasure chest full of wisdom. 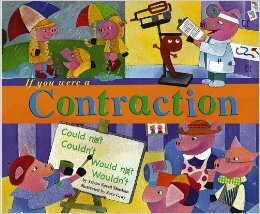 I inquired about diverse reactions we’ve received from reviewers pertaining to alliteration in picture books. (Who’s right, those for and against?) Trisha laughed, because she wrote a book called, IF YOU WERE ALLITERATION. 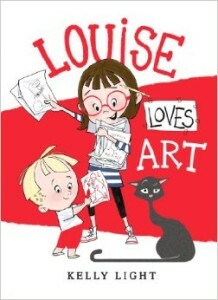 For picture books, she loves it. 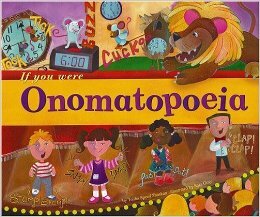 And she loves onomatopoeia. In fact, in my story she suggested I add more onomatopoeia, such as a “shuffled” during the stampede scene. The process is similar to ours, but more formal. The “summary” helps determine whether the writer’s vision has been successfully communicated. 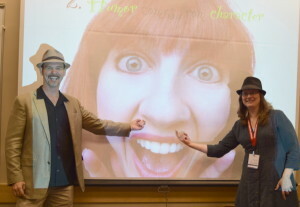 A bonus: it’s a helpful tool later, when creating a pitch. “What works” helps the writer determine what to keep. “Questions” make the story stronger. For instance, Trisha asked some of the same questions you asked. That showed me what I need to clarify. She said it’s important to know the rules of the world we’re creating and stay consistent. And sometimes to be generous and just tell the reader information directly, rather than trying to be subtle. Shuddering, she slumped over her tomatoes and stroked the empty peddler space on her sash. Her critique for my manuscript was a page and a half, single-spaced. She suggested starting with the above format, then she will follow-up with line-by-line reviews after the questions have been addressed. I hope I’ve shared something that will help you as well. 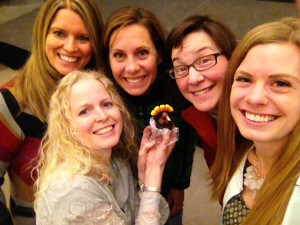 Much thanks to Trisha for her thoughtfulness and generosity! Watch for more Speed Shaskan wisdom in future posts. 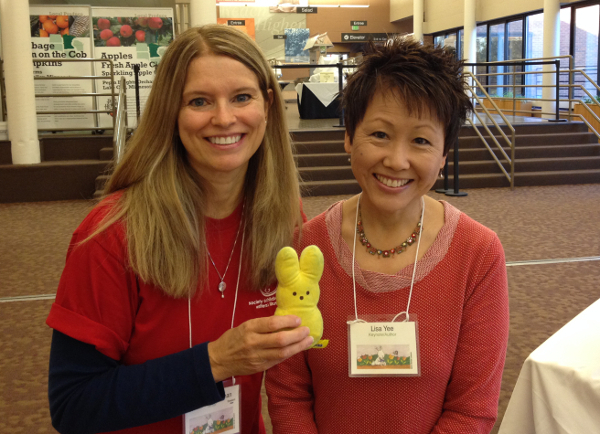 Peepy with Lisa Yee and me. 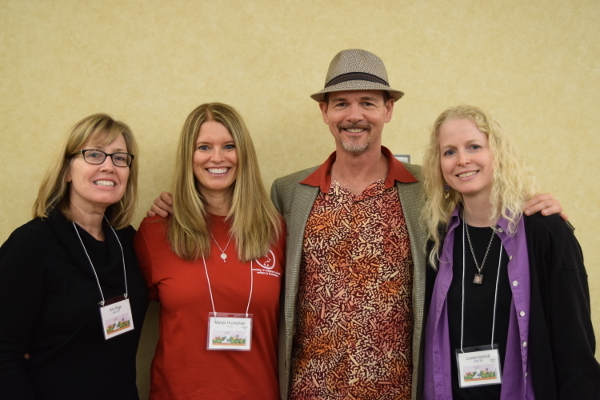 The 2014 MN SCBWI Conference brimmed with colorful characters. In her keynote “Schlemiel, Schlimazel, Give Us Any Chance, We’ll Take It,” KellyLight, creator of the Louise Loves Art series and illustrator of Elvis and the Underdogs and The Quirks, invited participants on her Laverne and Shirley-inspired journey toward children’s book superstardom, encouraging us to take chances and push forward. The realism in Lisa Yee’s work stems from her inspirations, real live people. Yee’s son Benny inspired Bobby vs. Girls (Accidentally) and Bobby the Brave (Sometimes). Marley Sandelski first drew notice as a supporting character in Stanford Wong Flunks Big-Time. But, when he became an inadvertent stop-bullying ambassador for real kids, Marley earned his own book as the protagonist in Warp Speed. The Kidney Hypothetical–How to Ruin Your Life in Seven Days came about when Yee’s daughter took a dangerous dare. Learn more about Lisa Yee, the 2014 Sid Fleischman Humor Award-winning author, at lisayee.com. 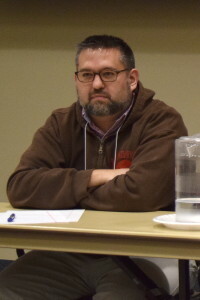 Sunday intensives by Bruce Hale, Carter Hasegawa, Lisa Yee, and Kelly Light proved to be a bittersweet opportunity–like being told you can only have one Lays Potato Chip. 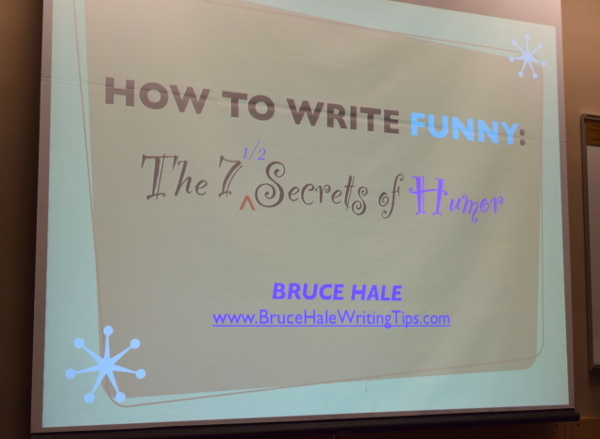 Turns out I could have used another hour/week/year of Hale’s instruction. Funny can be dissected and analyzed. Don’t try to get too cutesy. Do give them the humor they like. Do let them finish the punchline. For more writing tips, see BruceHaleWritingTips.com. Against the assault of laughter, nothing can stand. My conference highlight was being selected for the 2014-2015 Writer Mentorship. Mentor Trisha Speed Shaskan, I won’t take this blessing lightly. (No pun intended, Kelly Light.) Congratulations, Illustrator Mentorship winner Joanna Hunt! You’ll love working with Illustrator Mentor Nina Crittenden. 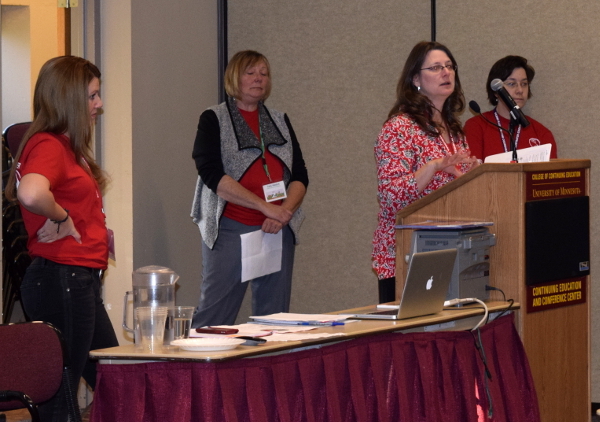 Thanks to the leadership and volunteers of the Minnesota Society of Children’s Book Writer’s and Illustrators (SCBWI) for coordinating a fabulous 2014-2015 conference. Event organizers usually hear more from participants about technology glitches and rest room malfunctions than when the life-bettering experiences they orchestrate. I hope that wasn’t the case this October. I don’t think any toilets overflowed, but our cups sure did, with professional guidance, reinvigorated vision, and fellowship with other writers and illustrators. Saturday, October 11, keynotes, workshops, and manuscript reviews were topped off by book signings, a reception, and a portfolio showcase. Bruce Hale, author of over 30 books for young readers, including the award-winning Chet Gecko Mysteries, School for S.P.I.E.S, and the Clark the Shark picture books, led the charge with Writer’s Mind, Warrior’s Mind: Winning the War of Art. Write like your hair is on fire. Think it through, take the big view. Teamwork makes the dream work. 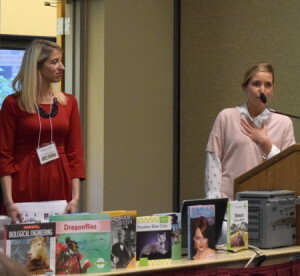 Saturday workshops included Carter Hasegawa, Assistant Editor, Candlewick Press, presenting Researching the Fantastic; and Emily Clement, Associate Editor, Arthur A. Levine Books presenting Love at First Sight: The Great First Page. Since the workshops occurred simultaneously, I only have notes on Emily Clement’s workshop. When Clement receives a manuscript she asks herself these questions: Does it evoke emotion? Does it have that little something extra? Does it make her feel something? Does it exude authority and confidence, a language and style that intrigues, and expectations, hints, or promises? 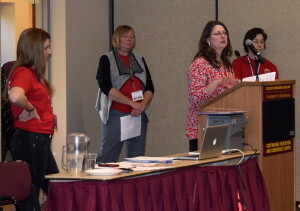 Look for more conference highlights about Lisa Yee, Kelly Light, and ABDO Publishing in upcoming posts. 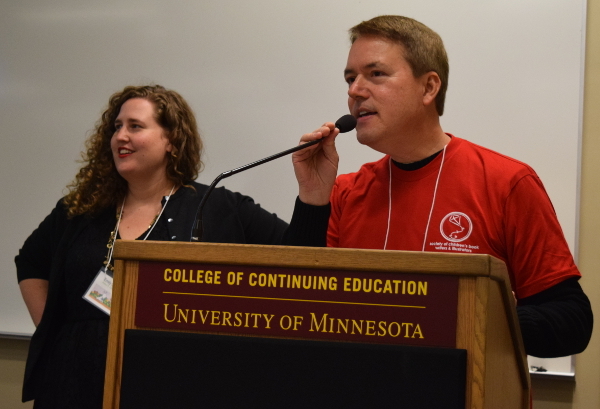 In the meantime, check out my 2014 MN SCBWI Conference Photo Album where you’ll see the photos from this story and more. BJ Novak proved this wrong. 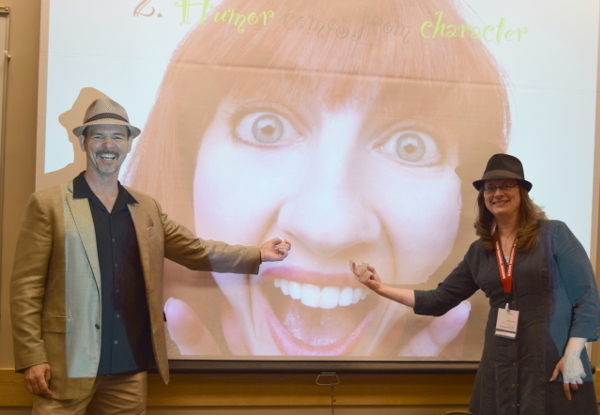 Writing well involves community. A fabulous opportunity awaits you in just two-and-a-half weeks. 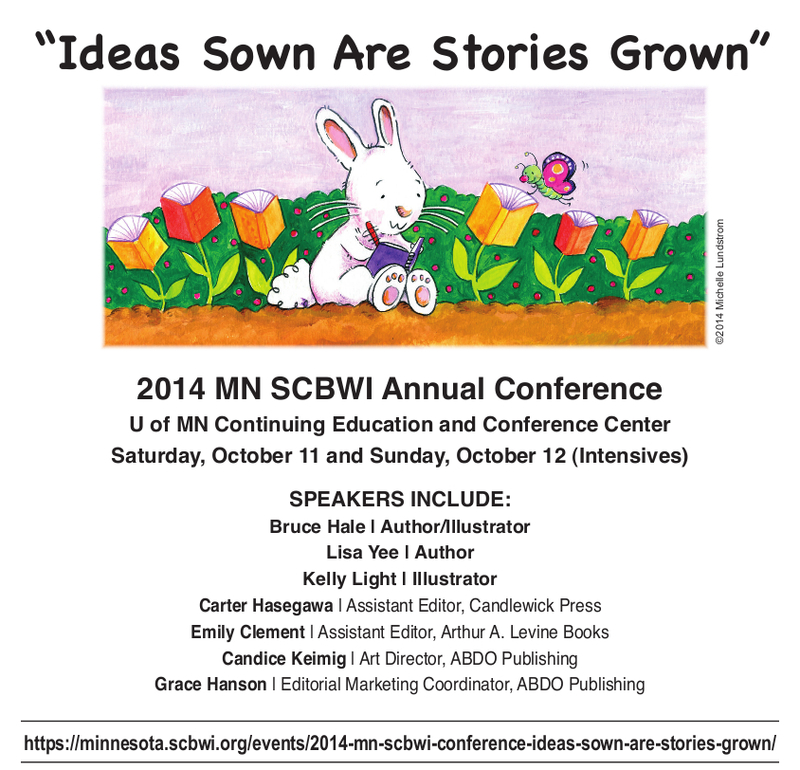 The 2014 Minnesota Society of Children’s Book Writers and Illustrators will hold their annual conference. 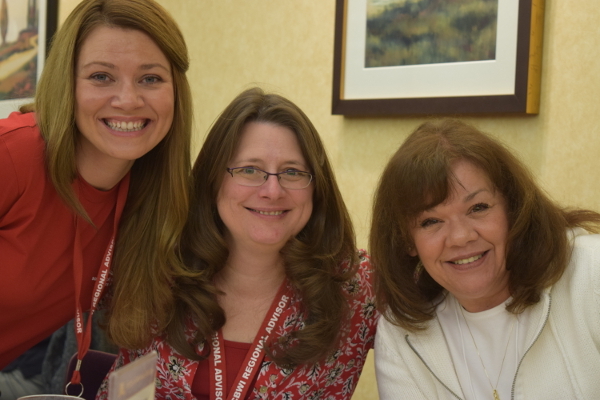 The first perk of the conference will be the wisdom you’ll gain; the second, the relationships you’ll develop. If you haven’t signed up, it’s not too late. We can’t wait to see you there! MY DAD IS BIG AND STRONG, BUT . . .